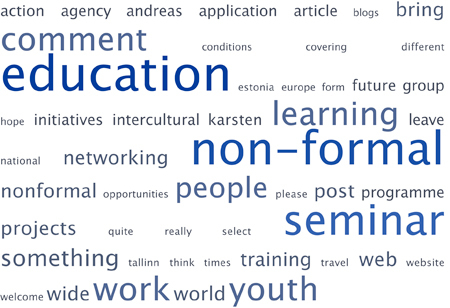 During the welcome evening, we had prepared a tagcloud of everbody’s website on paper. Equipped with these keywords, conversation was easy — and the discussions quite interesting! Here are some impressions from the evening, as well as an example for a tagcloud (this one from the seminar announcement) and a link to the website we used for generating the clouds – tagcrowd.com. Tagcrowd is run by Daniel Steinbock, a doctoral student at Harvard University. Daniel studied at Stanford University before (which has admittedly nothing to do with Texas…).